Quote of the Post: "We have gain the fort, but lost the lion" - Shivaji mourned when he heard that his general (Tanaji) has been killed in the battle. so it named as Sinhgad. It was another S(F)unday. We didn't executed any plan so quickly. We decided to visit the place around 11 am after our sleep, and we were set to go at 12 noon. On one hand Swine flu was increasing by leaps and bounds in the city and another it was time for grand celebration of Ganesh Festival all around. 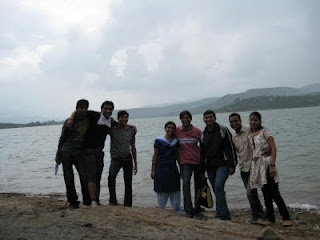 Our journey started from Magarpatta city, and our first stop was Khadagwasla Dam. 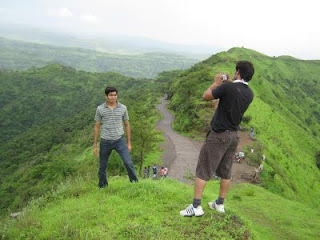 This is just 20 km away from Pune in the way to Sinhgad fort. 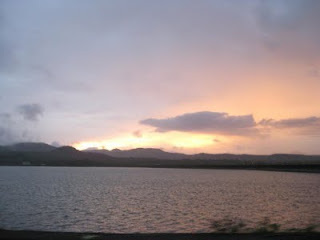 The dam is major water resource for Puneites. Sinnhgad road alongside the dam is a picnic place, specially during the monsoon. Don't forget to enjoy the sweet corn. Now Its time for Indra to add beauty to the place. 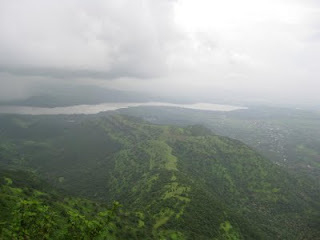 Mild rain started and we proceeded towards Sinhgad, the lion fort. 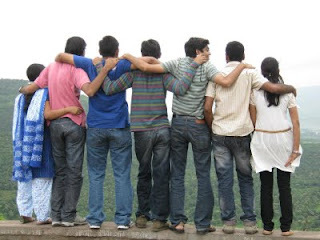 The place is like a bed of roses for all nature lovers, poet, trekkers, photographers. 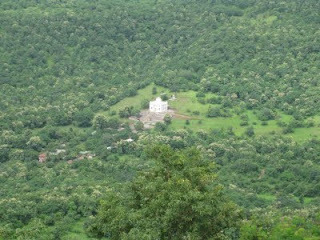 It is just 30 km away from Pune city. 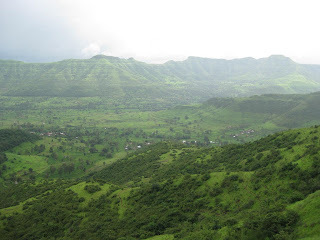 To reach Sinhgad foothills from Pune (to & fro) is pretty easy. You have plenty of options as by PMT buses, your personal bike, car, zeep etc. You will get a point, from where you need to park your vehicle, and start trek. It is about 2 hour including some small breaks (Though you can prolong your trek by . You will find local snacks to eat & drink as Onion bhaji, Chaas(Butter - milk), limbu-sharbat (neebu-paani or Lime juice), corn. Just at the start you will get the Pune Darwaja (Pune Gate). At the start there are stairs and then you can explore the places. The breezy air and pelting rain creates the atmosphere as an icing on the cake. There are many points all around as - Wind point, Daaru Point (Drink point), Lover's point, Tea point, Suicide point, Shoot points, and P :) point. What's your point dear! Thanks to Tara & Rajesh who initiated this plan, Mrunal who provided us his bike, and Nitesh who invited us for dinner. Later on, we enjoyed Tambola at Nitesh home. 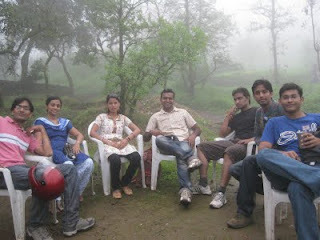 I have visited this place 3-4 times with my family and friends, But I love the place mostly during the monsoon. I like your work.